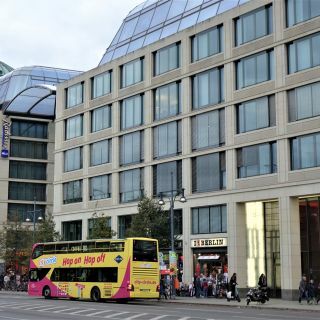 Start or interrupt your hop-on hop-off sightseeing tour of Berlin at stop DomAquarée and discover how this CityQuartier combines shopping with tourist attractions and urban living. The DomAquarée, located at the river Spree, is the place to be in the heart of Berlin. It perfectly combines shopping with tourist attractions and urban living: 580.000 visitors annually to the DDR Museum, 1.500 tropical fish in the AquaDom, 25.400 square metres of office space, 35 international shops and restaurants, 75 exclusive apartments, 600 parking spaces. Tip: Get a combined ticket and take part in the one-hour boat cruise "Historische Stadtrundfahrten” of the shipping company Stern und Kreis Schiffahrt GmbH. Start is at the boat station Nikolai Quarter. Discover Berlin from a different perspective. The highlights include: TV Tower, Berlin Cathedral, Reichstag, Museum Island, House of World Cultures and government district with Chancellor's Office.